Anyway, it's been far too long—four-and-a-half years!—since Green Day's American Idiot was released. It was an album in heavy rotation on the stereo D'luv when I started Chart Rigger back in January 2005, and I used to rail against 50 Cent's "Candy Shop" for keeping both "Boulevard Of Broken Dreams" and Kelly Clarkson's "Since U Been Gone" stuck at #2 on the Billboard Hot 100 during that time period. 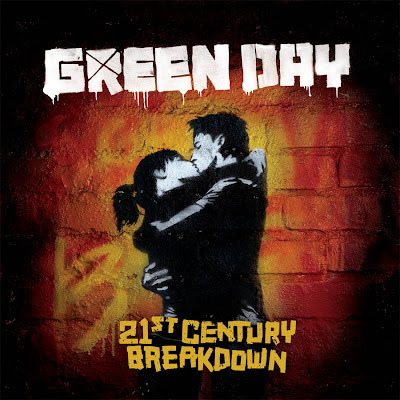 Yesterday, Green Day announced that their new studio album 21st Century Breakdown will be out in May. Today the band unveiled the album cover (above), which features art by Sixten. It'll be the band's eighth studio LP, and will feature co-production by Garbage's Butch Vig, who, amongst a zillion other albums, produced Nirvana's Nevermind and the Smashing Pumpkins' Gish and Siamese Dream. * The U2/Green Day Banterview!